Editor’s Note: We asked our Vice President of Product, Thomas Fanelli, to share his expertise on personalization and audience segmentation. Here are his five tips to get started. Over the last six months we have been experimenting with personalization to improve the performance of our customer communication. We’ll explore some of the results we have seen along with five tactics you can use to increase your email engagement. Be Timely — The message reaches the customer at the right time. Be Relevant — Delivering relevant information for the recipient or time. Be Actionable — A clear and compelling call-to-action. For example, you send a thank you email on a customer’s one-year business anniversary. Included in the email is an offer for a free gift card to a local coffee shop. This is a very basic email using an easy data point: the first time you and the customer did business together. This email is timely because you are sending it near the anniversary date. It’s relevant because it leverages the significance of the event to thank the person for their business. It’s actionable because the recipient needs to claim the gift card. Let’s explore audience segmentation, as it’s closely related to personalization. This is the ability for you to segment your customers into groups. If you own a pet store, you want to know things like who’s a dog owner or who’s a cat owner. This allows you to personalize messages based on product selection. Using segmentation, you can easily send the right messages to the right group of people based on interests, preferences, geography, behaviors, etc. 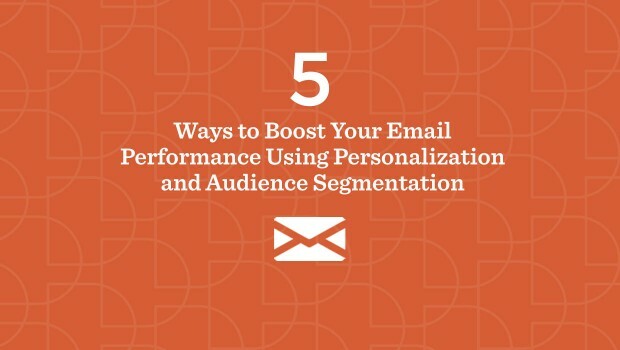 Putting these tactics into practice will have a significant impact on your email engagement. In the tests we ran, we received a 50 percent lift in open rates and 300 percent increase in click-through rates. In fact, studies have shown that personalized emails deliver six times higher transaction rates than general marketing messages. Here are five tactics you can use for personalizing your emails. Product Selection Personalization — This is a very common tactic and you’re likely familiar with it if you shop on Amazon and receive their suggested “Recommended for You” messages. To do this in your own email marketing, you’ll need to know your customers’ product preferences, but this is usually easy to attain based on past purchase information. You can then send an email that has specific product recommendations based on those preferences. Date Personalization: Birthday or Anniversary — This is a powerful way to incentivize your customers with a special offer, coupon, or gift. Make sure you have this key date stored in a custom field and merge it into the email. You can also choose to celebrate the birthday month instead of the specific day, making it easier to send if you have a large list. Remember you can also personalize the imagery to reinforce this is a birthday or celebratory event. Location and Time Zone Personalization — If your email list is located all over United States, or even the world, you should probably consider using time zone segmentation to boost your open rates. By using VerticalResponse’s segmentation tools, you can create lists based on location and choose the relevant sending time for each campaign. Personalized send times are reported to increase revenue by 8 percent. Gender Personalization — It’s a known fact that men and women respond to different colors, images, and language. By personalizing your messaging based on gender you increase your chances of higher user engagement and open rates. Seasonal Personalization — Many businesses appeal to seasonal events, whether they are in the clothing and retail business, or travel and events. Summer versus winter, back to school campaigns, holiday-based personalization, and so on allow your goods and services to fit into the relevant seasonal theme. Marketers in 2017 are making a massive shift towards personalization, but it’s still early! You can get the jump on your competition and make your messaging stand out by experimenting with personalization of your content.